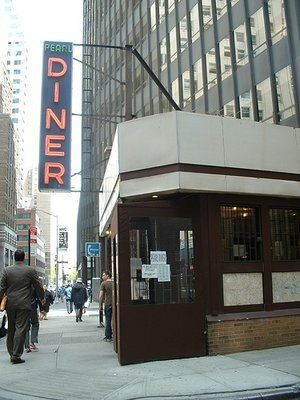 So during the holiday I thought I'd go there for breakfast. Won't be so crowded with so many people away... Uh-oh. Ugh. There's brown paper on the windows. And no note about just being closed during the holidays or anything. There's no outgoing phone message, and Seamless Web isn't taking orders. Will hold off on an obituary for the time being. And there's not much left down here with much soul. Just a half block away, one of the last Andrews Coffee Shops in the city closed in August 2010, as Jeremiah Moss noted. Noooo! I lived around the corner and was a regular from 2001-2004. I also frequented Andrew's quite often. But Pearl had free sour pickles. Now I work near by and eat there pretty often but haven't been since Sandy. If true this is huge, albeit sadly predictable loss. That's very sad news. I loved going there. interesting b/c even thought it's wall street where so much wealth (and well, bad juju) is concentrated, it's also one of the last vestiges of old new york. especially back in the day, there was an extreme amount of average joe's in the area and all the various businesses and eateries that cater to them... takes a lotta common working folk to support the mega rich.. everytime i'm down there, i see so many time-capsuley pockets of yore... and wonder if we'll have them in perpetuity... or if this area, too, will be subject to rampant disneyfication and AHHHHHHHHHHHHH UGHHHHHHHH NOOOOOOOOOOOOOO etcetera, etcetera, etcetera. ouch... I lived at 100 John till they wanted a 35% rent increase by my third year.. when I moved in Andrews was open an I was stoked! They closed a week later.. 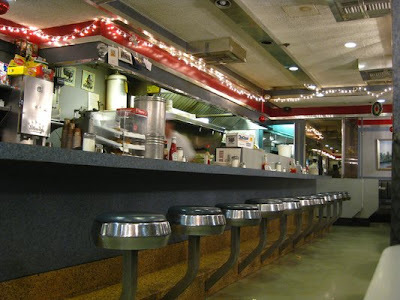 I just stumbled upon a classic style diner at 43rd and 11th Ave. At first I thought it was an ironic take, being that I rarely leave the hood it doesnt seem real that something like this still exists, but in fact, the clientele proved it is authentic. Turns out it is fairly new, but replaced a legendary haunt. ...we were there in mid-December and they were closed then. There was a lot of electrical work being done on that block at the time. Did you see anything like that? It looked like a Sandy-related job... I hope Pearl is not gone for good!! I walked by it the other day and say that the owners put up a sign in the window advertising its return. No specific date offered though.